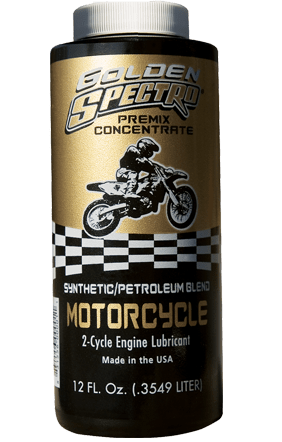 Golden Spectro Two-Cycle Pre-Mix Blend is the two-cycle engine lubricant that built our reputation. Probably the winningest oil out there. Because we significantly reduce excessive solvents (present in most two-cycle blends), running Golden Spectro® Two-Cycle Pre-Mix Blend at leaner ratios provides a higher level of detonation protection, stops plug fouling and smoking. Use according to motorcycle manufacturers’ recommendations, or at 50:1; this product exceeds API TC test requirements. Not for use in oil injection systems.